it is not a vitola I would often reach for, but it is very well made, and my kudos to the blender who put it together. It tastes great, starting out medium strength, but soft and creamy. It doesn’t have a lot of pepper on the tongue, but the retrohale really brings it out. I am enjoying it as it progresses… despite the small ring gauge, it is not burning too fast. It is producing very nice and light smoke, plentiful but not overwhelming. It is burning very evenly, and feels like the type of cigar I could smoke all evening long. I didn’t feel like I had to tap the ash, but after nearly an inch I opted to do so, fearing it might fall. Smaller ring gauges can be deceptive, and I didn’t want to be the night’s ash hole. The taste is getting a bit stronger toward the end of the first third, and the pepper is more apparent. Like a good spice, it is light coming in, but lingers perfectly. I punched it instead of cutting, which was a gamble with the small gauge, but it worked out well, and the double cap is holding up nicely. Because of my experience damaging cigars, I was concerned about the large and heavy band, which was clearly glued to the cigar. However I rolled it between my fingers, and it slid off perfectly. Kudos to the roller for the solid construction, always a concern on smaller gauge cigars. As I progress through the stick, the smoke seems to be getting stronger, but still not getting in the way… something I am less concerned with when I smoke outside, but inside can be a worry. The ventilation of the room is doing an admirable job of whisking it right up and out of the way. As Moicano and Kattar battle in the octagon, I am enjoying the fights almost as much as the cigar, but honestly, this cigar would be just as good watching a lesser card. I lit the cigar in the third round of the last fight (Magomedsharipov over Bochniak in a unanimous decision that was probably the fight of the night), and it is still going strong nearing the end of this match. The draw is as perfect halfway through the cigar as it was on the first light. I have not had to relight or repair the burn at all, and have not seen any reason to tap, but I do every inch or so for my own peace of mind. Moicano won a unanimous decision, and the second third of this cigar is so far a unanimous winner as well. Definitely a thumbs-up here, although the retrohale is now a bit stronger; not overpowering, but it is definitely noticeable. The last third is definitely stronger… not a full strength, but medium-strong for sure. The smoke has settled down again, and the ventilation holds up like the heavyweight champ. The fights are great, and so is the cigar. The next fight is the women’s straw-weight championship round… Joanna Jedrzejczyk is going into the ring against the champion Rose Namajunas, and it is going to be a real battle. The cigar is holding up and definitely wants to be a champion. I don’t know about that, but for a non-Cuban it could be a real contender in its class. In the last third it is a lot spicier than the beginning, and the fact that it has lasted this long is a testament to its construction. Will it last through five more rounds? Will the fight go the distance? I don’t know, but we will see! The cigar is pairing well with he homemade vodka provided by Eric, and the women are ready to fight. I am rooting for Namajunas (the champ), but it is a rematch, and Joanna wants her belt back. The cigar is holding up as well as either competitor. The fights are in Brooklyn, the backdrop of the book I recently finished on Jewish gangsters of the last century. How fitting is that?! With three minutes to go in round 4, I am surprised the fight has gone this deep, and I am surprised the cigar has gone this long. Just like a good long-distance strategic fighter, it has taken its time to really show its strength. I am down to the last inch, and it is giving me a bit of a head rush… unless that is Eric’s vodka. 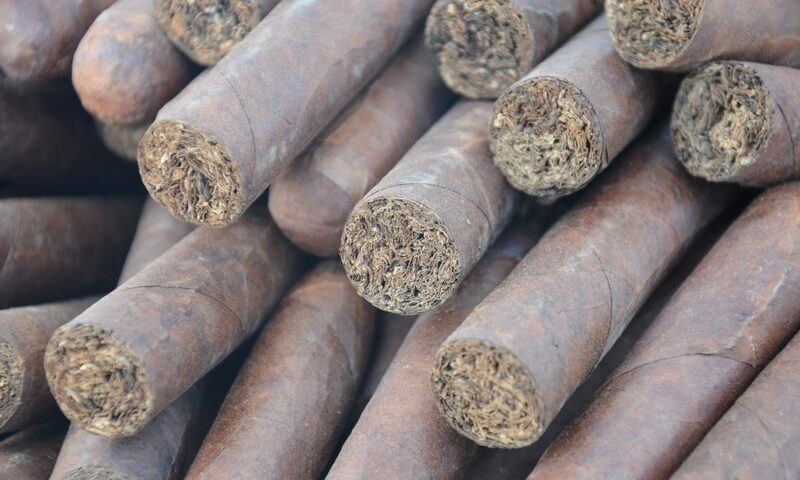 It is definitely a full strength cigar, and while it will not be champion, it will definitely go the distance. On my next trip to the US, I might have to pick a box of these up. What I originally thought would be a lunchtime cigar will definitely last a good 90 minutes, a real surprise for sure. The last round will decide the fight, and will mark the end of this cigar. I am going to be sorry to say goodbye, but like the end of a visit with a friend, it cannot go on forever. Thank you CAO for this excellent stick. A real contender, no doubt. I give it two thumbs up, and look forward to seeing who the judges give this match to. The fight is over! The women went the distance, and the respect between these two warriors is obvious. They hugged and raised their arms in the air together. I do not think the title will change hands, but I would bow deeply to both for their incredible perseverance. Their first fight did not see the end of the first round. This one went 25 minutes. As Joe Roger said, two champions for sure. Rose won! Still champion, Rose Namajunas fought an incredible fight, as did her opponent. The cigar lasted to the end, and all three have my full respect. Previous PostPrevious Smoking with the boys!